Fancy financing and accounting gymnastics won’t ride to the rescue for Metro 2025. Public Private Partnerships. Tax Increment Financing. Infrastructure Banks. These are among the many ideas discussed today as panaceas for public infrastructure funding, including major transit investment projects in the region and the nation. Certainly they can be helpful tools, especially in an era of declining federal funds and a renewed emphasis on local fiscal austerity. But can these tools be useful in funding or financing Metro 2025? Spring Hill Silver Line Metrorail station. The Silver Line was financed in part by special tax districts. Metro leadership wanted to find out, so between November 2013 and January 2014, Metro gathered leading experts in real estate, transportation and municipal financing from academe, management consulting, policy advocacy and government to solicit the best ideas for innovative ways of addressing Metro’s challenge. We learned that each of these financing techniques has differing strengths, weaknesses, and potential applications to capital projects. We also learned that none of the techniques actually provides new funding. Which is, ultimately, what is necessary to make Metro 2025 a reality. The distinction between financing and funding cannot be overstated, and is a key concept that often confuses the dialogue surrounding how to execute major capital projects such as transit investments. Techniques such as Public-Private Partnerships, Infrastructure Banks, and Value Capture rely on existing sources of funding to channel and make more available monies to public entities to pay for varieties of projects. These existing sources of funding are often taxes – either on households, businesses, or property owners – and backstopped by jurisdictional guarantees to tap into general funds or issue general obligation bonds should the stream of cashflows become unstable. These financing techniques do not generate new monies nor eliminate the ultimate obligations of the public sector to provide the monies to contribute to the cashflows, either upfront or over time. You can read more in the attached report, and know that Metro’s leadership is committed to evaluating any and all options to fund Metro 2025. Leaving no stone unturned, we conclude that as of this moment in time, regional leaders must step up to the plate and commit resources to Metro in order to make much-needed projects like eight-car trains, core station improvements, and the Metrobus Priority Corridor Network, leap off of the page and become part of the region’s transit network. 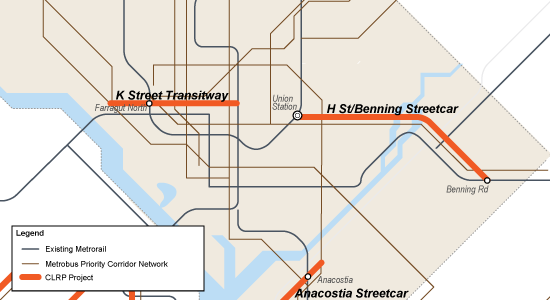 Though many of the stations that Metro 2025 seeks to improve are in the District of Columbia, the capacity expansion would help riders from all jurisdictions. 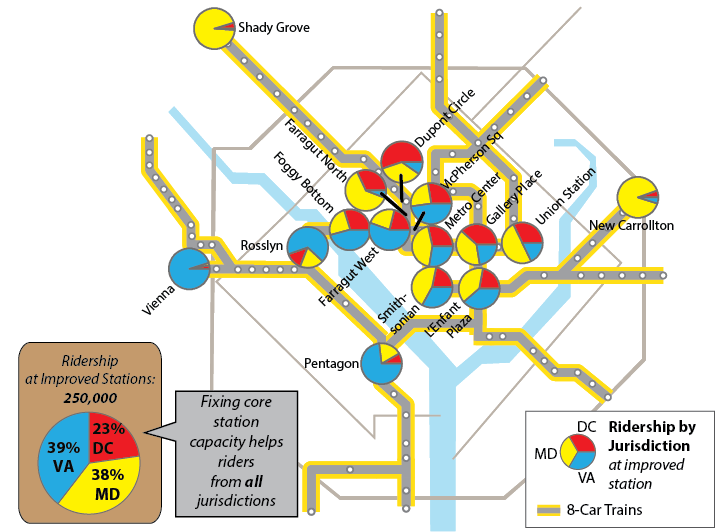 Metro needs to improve the capacity at over a dozen stations: some of these stations are at capacity today, and our 100% eight-car train program will bring even more customers to already crowded stations. We know we need to build new escalators, expand mezzanines, and build pedestrian passageways to meet this future demand. The fact is that Metro 2025 is designed to benefit the Washington metropolitan area, residents of the District, Maryland and Virginia, as well as visitors from around the country and the world. If you’re a commuter in Maryland or Virginia, it may look like the benefit of these improvements are focused on D.C. residents. 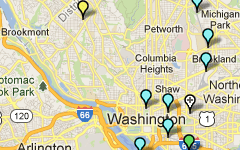 After all, 10 out of the 15 stations are located in the District of Columbia. 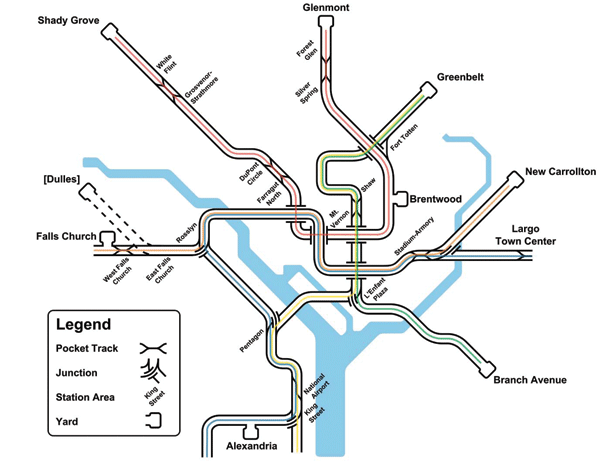 But the diagram below shows most of the riders who use these stations – those who create the need today, and who would benefit from fixing it – live in Maryland or Virginia. In fact, 77% of the users of the Metro 2025 stations live in the suburbs. 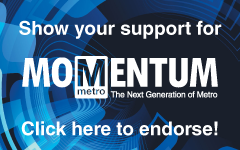 Help us make the Metro 2025 projects in Momentum a reality! Learn more about Momentum, call on your elected representatives, and endorse the plan. Metro 2025 would bring significant benefits to northern Virginia, allowing the region to thrive economically while preserving regional vitality. Think Metro’s Momentum plan is all about “downtown?” Think again! Our seven Metro 2025 initiatives – from eight-car trains to bus-only lanes will bring dramatic improvements to the quality of life and transportation to northern Virginia. The Silver Line extends Metrorail by over 20 miles, and will generate tens of thousands of new riders per day when Phase II opens – many of whom will travel into Metrorail’s already congested core. The Columbia Pike Streetcar will transfer 32,000 riders per day to and from Metrorail at Pentagon City – at a point in the system that is already maxxed out. 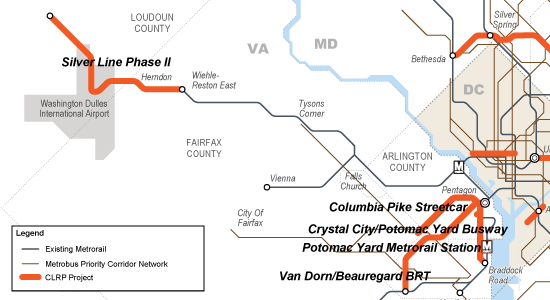 Two other planned busways (Crystal City/Potomac Yard, and Van Dorn/Beauregard) also connect with Metrorail stations. 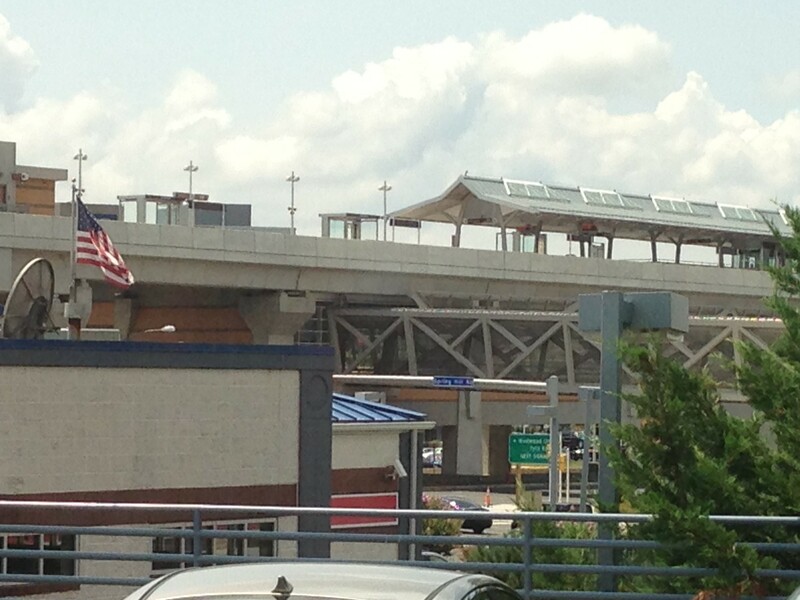 All major transit projects funded in the CLRP in Northern Virginia depend on the “backbone” of Metrorail and Metrobus. Metro 2025 would bring significant benefits to Maryland, supporting its economic growth and ensuring its future vitality. Metro’s Momentum plan calls for seven Metro 2025 initiatives – from eight-car trains to bus-only lanes, which will bring dramatic improvements to the quality of life and transportation to Maryland. Maryland has great plans for transit. The Corridor Cities Transitway, the Purple Line, and the Viers Mill Rd Busway are all included in the CLRP with a reasonable expectation for funding, and the Federal Transit Administration announced recently that the Purple Line would receive $100 million in Obama’s latest FY15 budget. Additionally, Montgomery County is developing plans for a county-wide BRT system. These projects are worthwhile ventures, but they will always rely on the supporting regional “backbone” of Metrorail and Metrobus to deliver their intended results. At the very least, these three important projects would not connect to each other if not for Metrorail and Metrobus. And at the very worst, if these projects are built and connect to a system that is already over capacity, they may struggle to live up to their mobility goals. 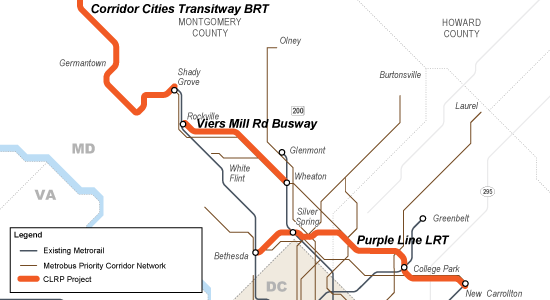 The Viers Mill Rd Busway will connect to three Metrorail stations. The current Metrobus Q-Line, a part of the Priority Corridor Network (PCN), currently provides over 8,800 trips per day, including approximately 800 transfers a day to Metrorail. 10,000 Purple Line riders per day will come to and from Metrorail, where the Purple Line connects to the Red, Green, and Orange lines. Many of these passengers will further strain the over-congested lines of the rail network. Funded Maryland transit projects, in the CLRP. By ensuring that Metro services can keep pace with congestion and demand, Metro 2025 is critical to making Maryland’s transit projects a success, and critical to helping the region and the state reach its transportation goals. Maryland’s population in the Compact region is growing steadily and projected to continue growing. This growth is crucial to the economy of the state – 40% of Maryland’s state economic output came from the Washington region’s suburbs in 2012. With that growth comes significant transportation needs, and Metro 2025 is critical to meeting that growth. Leading this growth has been Gen Y, who increasingly take public transportation if they even have driver licenses. By 2040, suburban Maryland is projected to see an influx of nearly 360,000 jobs (PDF), or an increase of 42%. Metro 2025 would bring significant benefits to the District of Columbia, allowing the city to thrive economically while preserving neighborhoods and downtown vitality. Metro’s Momentum plan calls for seven Metro 2025 initiatives – from eight-car trains to bus-only lanes, which will bring dramatic improvements to the quality of life and transportation in the District. The District has committed to a 50% market share for public transportation, and is building a Streetcar and expanded Circulator network that will depend on robust Metrorail and Metrobus services. Metro concurs that the Streetcar and Circulator are worthwhile ventures, but they will always rely on the supporting regional “backbone” of Metrorail and Metrobus in order to deliver their intended results. Consider that every single planned D.C. Streetcar line in the 22-mile system begins, ends, or connects with a Metrorail station, and the importance of sufficient capacity on Metrorail becomes quite clear. Today, more than 100,000 people a month transfer between Metro and the Circulator. By 2040, even the first few lines of the D.C. Streetcar (those funded in the CLRP, not even counting the full 22-mile system) are projected to generate thousands of additional transfers to Metrorail and Metrobus each day. D.C. Streetcar projects funded in the CLRP. The planned 22-mile system would construct even more lines. By ensuring that Metro services can keep pace with congestion and demand, Metro 2025 is critical to making D.C.’s transit projects a success, and critical to helping D.C. reach it’s transportation goals. 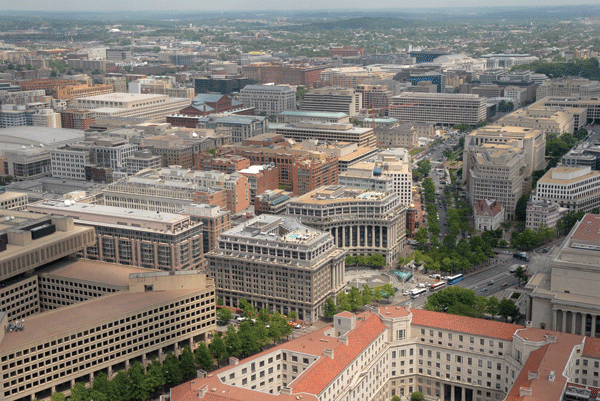 The District of Columbia’s population is surging, and its economic and population growth is only projected to grow. With that growth comes significant transportation needs, and Metro 2025 is critical to Metro’s success in meeting that growth. Since 2000, the District’s population has boomed by over 13%, and in 2013 topped 640,000 residents for the first time since the 1970s. By 2040, D.C. is projected to see an influx of nearly 200,000 jobs, or an increase of 25%. Four reasons why we need to begin the Metro 2025 investments now. 1. Because Metro 2025 is critical for growth. For the last three decades, the Washington region has grown in lockstep with an expanding transit system. Since Metrorail opened in the late 1970s, the system has grown steadily, and in 2014 Metro provides two to three times more service (rail and bus vehicle-miles) than it once did. For decades, this region has grown in lockstep with Metro. Today, no significant new Metro service is planned beyond the Silver Line, yet MWCOG estimates that the region will continue to grow at a steady clip for years to come. The only transit expansion projects that are planned complement and depend on connections to Metro, such as the Corridor Cities Transitway or Columbia Pike Streetcar, and may even increase the strain on Metrorail’s core. 2. Because we could lose jobs. Without investment in the region’s transit backbone, economic growth and prosperity is threatened. In fact, studies have shown a clear link between growing congestion and declines in job growth. Without Metro 2025, this region could stand to lose nearly 133,000 jobs by 2040. 3. Because Metrorail is crowded, and it will get worse without Metro 2025. Today, Metrorail is reaching its capacity in many places. On the Blue and Orange lines for instance, Metro is running trains every 2.5 minutes, which is the most the infrastructure can handle, but even so, many trains are too full to board, or experience uncomfortable levels of crowding. Lines form at many stations to get through escalators, elevators, and fare gates. 4. Because Metrobus is stuck in traffic and needs relief. Metro’s buses are frequently caught in street traffic, which increases travel times, degrades reliability, and increases Metro’s operating costs just to maintain frequencies. Illustration of Metrobus speeds from 2009. The red is 5 MPH or less. Click for full version. 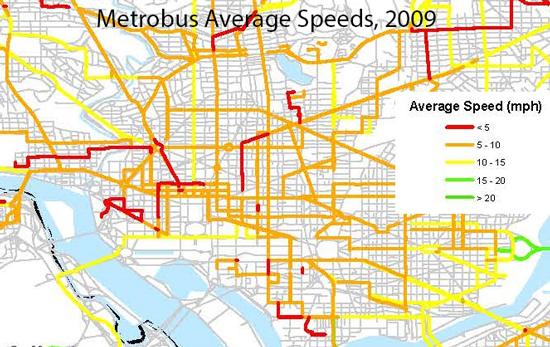 In fact, numerous Metrobus corridors operate at speeds of less than 10 MPH, and several showed speeds of under 5 MPH. On many corridors, buses operate at a brisk walking pace even though they are carrying many more passengers than the traffic around them. On H and I Streets NW, buses carry 40% of the passengers but are only 2% of the vehicles. On 16th Street NW, buses carry 50% of the passengers, despite using just 3% of the vehicles. To increase bus service, speeds, and reliability, we need to invest in bus-only lanes, bus priority at traffic signals, and additional buses. What Are the “Metro 2025” Projects in Momentum? Metro’s Momentum plan calls for seven medium-term capital initiatives – known collectively as Metro 2025. And last week, Metro applauded a funding agreement from Maryland, Virginia, and the District of Columbia for $75 million as a “down payment” to begin work on Metro 2025. This is welcome news, indeed, and allows Metro to prepare to begin work on much-needed capacity increases to support the region’s growth. Today, most Metrorail trains have only six cars, and that means crowding – which is only projected to worsen. This project would enable Metro to run all eight-car trains in the peak period, which are the longest possible in our stations, and add 35% additional capacity to the rail network. It would expand the rail fleet and yards, and improve the power and signal infrastructure to handle the load. If we lengthen the trains, we need to expand key stations as well! Since-eight car trains add capacity for 35,000 more trips per hour, 80% of rail customers transfer or alight in the core, and most of these core stations are already over capacity, we need more core station capacity. This project would enlarge platforms, and add escalators, elevators, stairs, and pedestrian passageways to 15 stations. The Priority Corridor Network would construct bus-only lanes, give buses priority at traffic lights, and bring service similar to MetroExtra to 24 lines throughout the region. The PCN will take tens of thousands of cars off the road, add 100,000 riders, moving buses 50% faster, and cut fuel costs. In addition, this project would expand Metro’s bus fleet by around 400 buses, allowing us to increase frequencies. Metro faces a bottleneck at Rosslyn station, where three lines (Orange, Silver, Blue) converge. This major project would try to fix this bottleneck, and restore six-minute Blue Line frequencies between Pentagon and Rosslyn stations. We are analyzing the feasibility of a few options, including a second Rosslyn Station that would enable underground transfers between the two stations. This program would expand our current communications infrastructure to provide an integrated one-stop communication hub for the regions’ transit customers. Improvements would include: radio system upgrades, real-time bus information at bus stops, and new public address system at stations. This project would add special trackwork at key locations in the rail network to give us more flexibility with Metro’s two-track system. These new tracks would allow us to turn trains around, add system flexibility to Metro’s two-track system, and store trains at important locations. Now that Momentum has been adopted by Metro’s Board of Directors, what’s next? How can the region ensure that the plan is implemented? What is Metro doing internally to make sure the organization is on track? What can you do to help? The seven projects in Metro 2025 will reduce road congestion, save money throughout the region, add riders to the Metro system, and make Metro rides more comfortable and efficient. Metro 2025 investments will take 135,000 cars off the region’s roads, adding 300,000 boardings to transit, each day. This will help to reduce congestion while increasing transit ridership. With 100 percent eight-car trains, Metrorail will be able to carry the majority of those trips and have adequate capacity to carry the expected ridership of over one million daily trips by 2040. Implementing the full Priority Corridor bus network will enable increased bus use by over 100,000 daily trips by 2040. Next generation communications have helped draw new riders in Boston and Chicago. These investments save all travelers time and money, regardless of whether they ride. Four of the Metro 2025 projects are prerequisites to outward expansion of Metrorail. Eighty percent of Metrorail riders travel to, or transfer at, one of a dozen core stations, but the core is reaching its capacity. Before expanding, the trains, tunnels, and stations downtown need to be able to handle the demand. Metro 2025 does this, and lays the groundwork for future rail transit expansion in the region. Adding special types of tracks at key locations in the system will provide more flexibility to the overall system.